The «Planetary» colour-system designed in 1983 by the Frenchman Michel Albert-Vanel is intended to incorporate the effects of the colour sensations which we encounter each and every day. Colours influence each other, changing with the surroundings in which we see them. 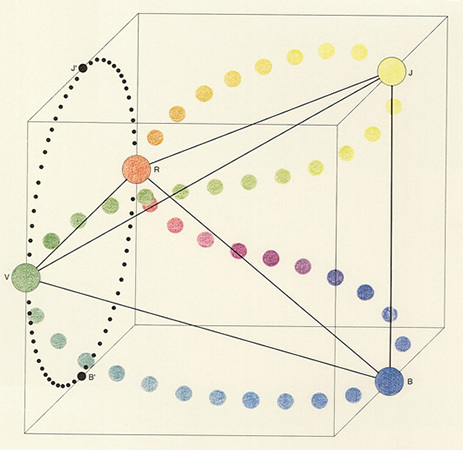 The basis of this novel and unorthodox system are the rotating planets which represent Ewald Hering‘s four (psychological) primary colours: yellow (J for jaune), red (R for rouge), green (V for vert) and blue (B for bleu). The secondary colours are represented by orbiting moons. Colours are not abstract concepts but real sensations, usually experienced not in isolation, but in groups. We not only associate these groups with each other, but perceive them in their entirety. The planetary system introduces new parameters in order to describe the context in which a colour exists. For any individual colour, contrast and material join the usual trio of hue, brightness and saturation. Contrast unites three new scales describing mixtures or groups of colours. One scale again considers hue, extending from monochromatic (without contrast) through to polychromatic (full contrast) colours. The two other scales involve brightness and saturation, and also range from plain to sophisticated colours. The material also brings three scales into the system which range from active (light) to passive (pigments), with the latter extending from transparent through to opaque, and from mat to gloss. A colour-solid may be constructed by selecting any three scales from this assortment of planetary scales. The system as a whole can be used to locate the colours of complex impressionistic pictures, for example, since an almost infinite number of colour combinations can be defined by it. Despite this huge number, the everyday sensation of colour still centres on a few main colour-groups, and can thus be represented by planets, orbited by numerous small moons. This is a multidimensional colour-space. Date: The Frenchman Michel Albert-Vanel presented his attempt at a multi-dimensional colour-space in 1983. Bibliography: M. Albert-Vanel, «Planetary Color», in A. 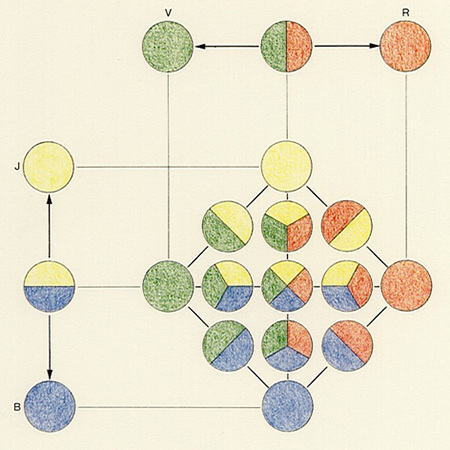 Hope und M. Walsh, «The Color Compendium», New York 1990.